On Wednesday, January 9, the RTRP wrapped up hosting an exciting two-day visit by six national site selection and incentive consultants who handle major relocation and expansion projects. Many of the consultants had not been to the region in over five years. This fly-in allowed our partnership the opportunity to reintroduce the consultants to the Triangle Region and see first-hand the growth and vibrancy of our communities. The fly-in also provided our economic developers the opportunity to strengthen their relationships with the consultants, which is vitally important in the economic development world. Day one began with regional and county updates, followed by visits to American Tobacco and American Underground, United Therapeutics, Citrix and NC State’s Wilson College of Textiles. The consultants heard from numerous regional partners, including: Regional Transportation Alliance Executive Director, Joe Milazzo; RDU CEO, Michael Landguth; EDPNC Senior Business Recruitment Manager Ellen Tai; NC Community College System VP of Economic Development, Maureen Little; VP of Capital Assets and Real Estate for Duke University, Scott Selig; American Underground Executive Director, Doug Speight; Leadership Triangle Executive Director, Jesica Averhart and NC Secretary of Commerce Tony Copeland. On the end of day one, the consultants attended the NC State vs. UNC basketball game and were joined by Governor Roy Cooper and former NCSU football players Torry and Terrance Holt. 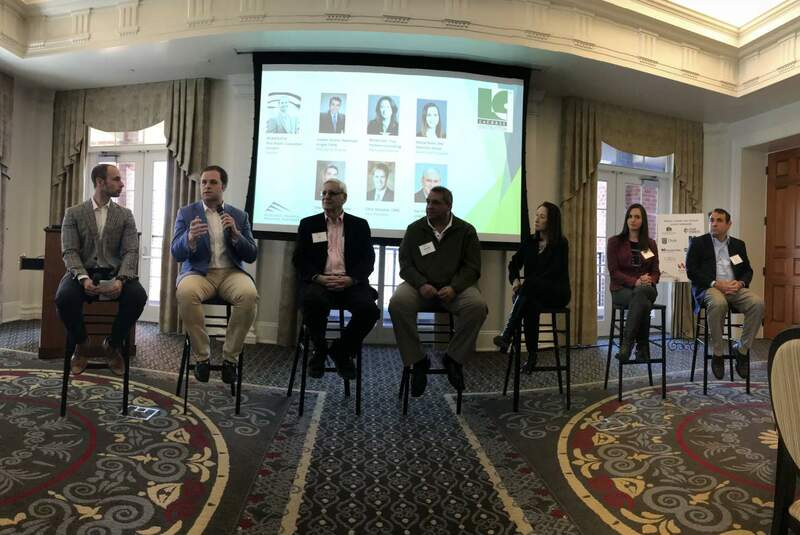 On the second day, the RTRP hosted two panel discussions on Centennial Campus’ Park Alumni Center and were joined by over seventy-five business and government leaders from the ten county region. The first panel featured Phononic CEO Tony Atti, Grifols North American President Sergi Roura, Walk West CEO Donald Thompson and NC State University Chancellor Randy Woodson on why the chose to do business here. The panel was moderated by retired US Ambassador Jim Cain. The discussions ranged from the incredible talent and commercialization coming out of our universities, highly educated and available workforce, cost and speed of doing business and our start-up culture. “One of the things our region does in a phenomenal way is the ability to integrate the needs of companies with the university infrastructure, so you get to know students and the talent you’re trying to recruit on their way up,” Thompson said. Following the first panel, the visiting site selectors took the stage and spoke about their perceptions of the region. Site Selector Joseph Gioino with Newmark Knight Fund praised the region for our collaboration across all counties, which he said is a rarity. When asked what was most surprising to learn about the Research Triangle, many consultants shared that the startup and entrepreneurial environment was eye opening. Minah Hall with True Partners Consulting said she had preconceived perceptions of the region, but once arriving was pleasantly surprised to find that the Triangle has much more to offer. “For me it’s really been eye opening that you’re so innovative and you’re so vibrant. That this is the perfect place to grow for lots of companies, not just tech,” Minah said. Chris Schastok, VP of CBRE’s incentive practice out of Chicago, closed the panel with encouraging words. Bringing consultants and companies to the region is extremely important to see firsthand the diverse and innovative ecosystem the region offers. The RTRP is committed to marketing the region and will continue to organize additional fly-in’s so others can see all the Triangle Region has to offer.